Hogarths Stone Manor at Stone in Kidderminster is a luxurious Worcestershire wedding venue. A couple of years ago, after changing ownership, the hotel went through an extensive programme of renovation and redecoration. As it stands now, Stone Manor hotel is a wonderful place to get married. The venue has many rooms licensed for civil ceremonies, from small and intimate to large weddings of over 100 people. There's also an option for having an outdoor wedding ceremony in the old pump rooms. For Tracey and Ian's Stone Manor wedding, they opted for an intimate indoor wedding with around 20 day guests. The weather was perfect, being bright and slightly cloudy but not too hot at the same time - the past month had seen temperatures average an oppressive 27 degrees, so the 21 degrees and gentle breeze were lovely to work in. In the weeks before the wedding, I had visited the venue with the bride and groom in order to scope out locations for some stunning wedding photos. It had been a couple of years since I'd photographed a wedding at Stone Manor, and this would be the first since the refurbishment had taken place. During the trip to the venue, we ventured into an area that I had not seen used in other wedding photos - an overgrown area to the far side of the venue, about 300 metres from the hotel itself. It's one of those places that if you didn't know it was there, you'd have to go looking for it. On the wedding day, everything went as planned, although the light wasn't quite perfect for some really nice photos of the bride and groom together. After the wedding and before the wedding breakfast, I took all of the formal group photos that the couple had requested. 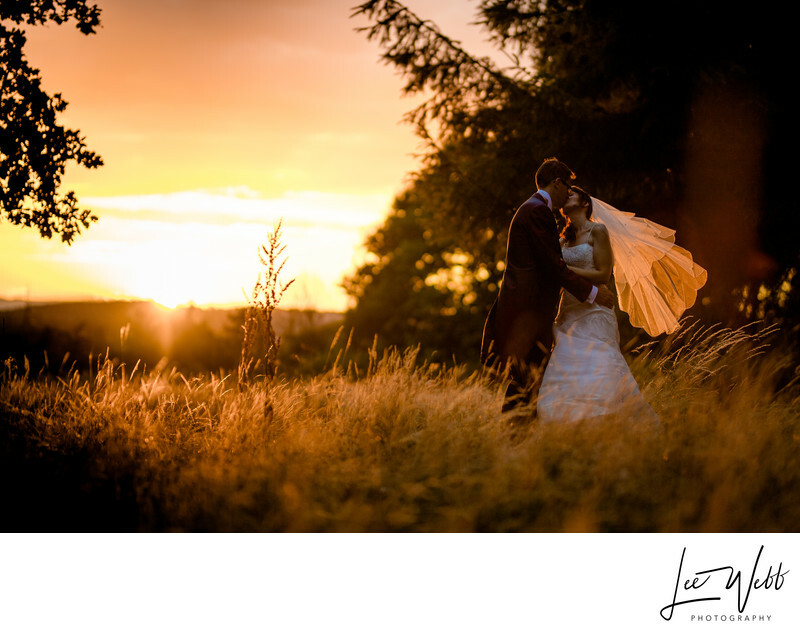 I checked the weather forecast and saw that it wasn't due to rain later, so between us we decided to take the couples photos after dinner, when the sun was lower in the sky and the light a little softer, more flattering and easier to work with. It wasn't until much later in the day though that this image was taken: I was actually taking a break with the videographer in the piano bar, sat happily sipping on my cappuccino and discussing the day when I looked out of the window to the location that we'd scouted on my previous visit. The long, dry grass was this incredible orange colour, so vibrant that it appeared it was being illuminated with a giant laser. Unsure as to whether I could use this for a photo, I sprinted the 300 metres to the location in order to check it out. The scene that greeted me was unbelievable, with the grass so bright as to appear to be on fire. I ran the entire way back, grabbed my camera and my favourite lens (my 85mm f/1.4) and said to the bride and groom 'there's an amazing sunset happening, but we need to go now' - the sun was already very low in the sky, and I knew that within two minutes or so the opportunity would be dead. The three of us made our way as quickly as possible to the clearing in the wooded area, and I managed to take photos for 30 seconds or so before we lost the light completely. This image is the best one from the series. That gentle breeze from earlier in the day had turned at times into a gust, and through nothing other than sheer luck, I timed a photo with the bride's veil being blown by the wind and illuminated by the setting sun. Running in a suit carrying my camera gear gave me a headache, and the bride's feet were really sore from walking around all day, made worse by the sprint to take this photo - but we all agreed on one thing; It was totally worth it.